Products Line ['AN-PAK' Line] | OSHIKIRI MACHINERY LTD.
Oshikiri has developed a completely automated system for yeast pocket buns (AN-PAN), and for filled and folded buns (CREAM/JAM BUN). 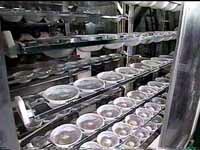 These buns which weigh from 95 to 140 grams (dough and filling) can be produced at a rate of 6,000 pcs/hr. This fully automated system for homogenized products drastically reduces the number of operators needed, yet still produces a stable high quality product without expensive manual operation. 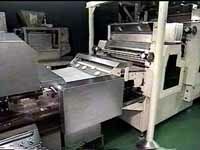 External seeders for the AN-PAN, and slitting for the filled and folded products is available. The volume of dough becomes larger with less dough damages. No dough leakage as dough pieces are rounded by eccentric movement when intermittent moving rounder belt is stopped. There is not heat due to no friction with metal as umbrella and bar typed rounders and cooling facility is not required. Doubled dough pieces and proofer empty trays are removed by electrical interlocking with the divider. Gyratory cups are selected from 5 kinds of cups and can replaced with one-touch. Tightness of rounding can be adjustable with changing the number of revolution and height of cups. Standard Proofer (eight pockets across), synchronous device between Divider/Rounder and Proofer eliminates empty pockets. One-touch replacement with plastic cups. Dustpans under tray chains prevent contamination. Independent drive eliminates product loss when up-stream operations are down. Less damaged products with larger sheeting rollers. Turn over the products after first sheeting, makes balanced moisture for the dough; better and stable production. Individual speed change for each sheeting roller. With ejector for the doubles. Quiet operation with timing belting. Suitable for the Pocket and Filled/folded products. Wide weigh range from 95 to 140 grams (Dough + Filling) will fit various products. With seeder for sweet bun and slit for the folded items. Excellent alignment for the products with switching conveyor and variable width for the products across. Designed for no foreign material contamination. Moulder presses and degasses dough in three steps. Positions dough and neatly put them on the trays. Dough is stretched and twice-folded to cover the rest half in case of Parker House roll. Bean jam bun is rounded with the dough wrapping the filling from six radial directions. 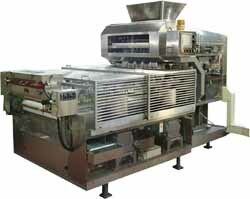 A unit to convey products for easier processing. Turn the dough around for appropriate spacing on a pan.